1 – What Is The Valley of Mo’ara? The Valley of Mo’ara is the breathtaking region inside Pandora – The World of Avatar, the newest land at Disney’s Animal Kingdom theme park. 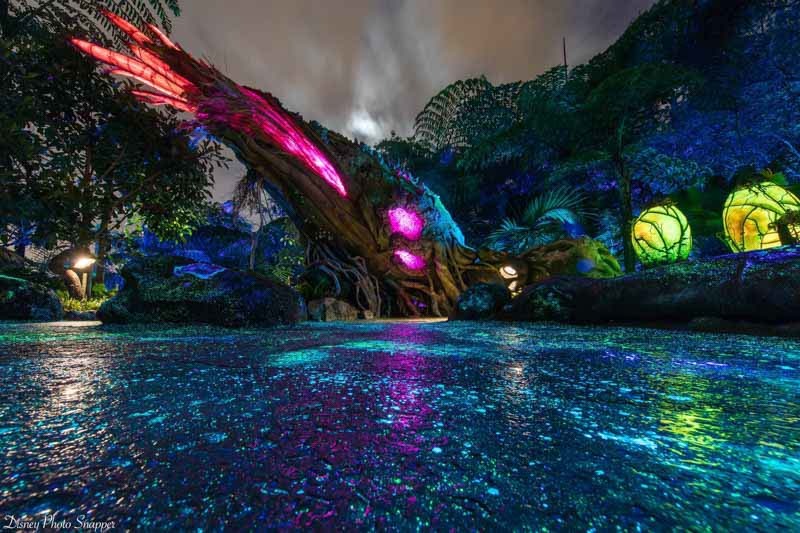 Most popular for housing Animal Kingdom’s two new attractions – Avatar Flight of Passage and Na’vi River Journey – Valley of Mo’ara is really an attraction of its own in our opinion! Valley of Mo’ara is the perfect Pandoran region for Disney to select for The World of Avatar because the land seamlessly pulls together the great theming throughout the attractions, dining, shopping, and experiences offered in this land. 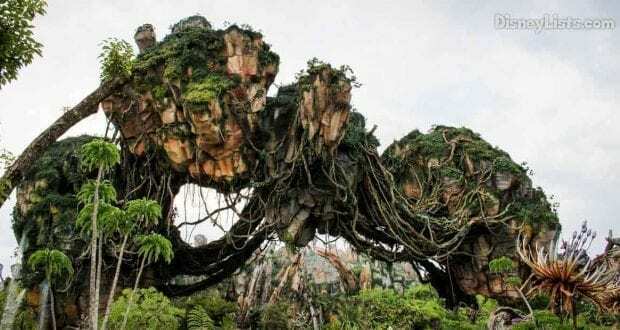 The Pandora – World of Avatar land in Animal Kingdom is based on the popular 2009 science fiction film, Avatar. In the movie, humans attempt to colonize a habitable moon called Pandora which is 4.4 light-years away! On this moon, the locals (known as the Na’vi tribe) live in the Valley of Mo’ara where the humans attempt to co-exist with the Na’vi and nature around them. You also learn in the movie that unfortunately the RDA (Resources Development Administration) caused a large amount of destruction to the Valley of Mo’ara. But, the great news is now guests at Animal Kingdom can see the Valley in its rebirth since the destruction! While exploring the Valley, it’s easy to see the beauty of the Valley and exactly why the Na’vi tribe treasures it so much with all the magnetizing surroundings! Stimulating all senses, this Valley is home to all of Pandora which is why we call it the heartbeat of this land. Outside of the detailed sights to experience in the Valley which we’re covering below, the Valley boasts the two popular attractions, Avatar Flight of Passage and Na’vi River Journey. Guests can also enjoy dining at the quick service spot Satu’li Canteen or enjoying the drinks at a lounge called Pongu Pongu. Shopping is exceptional at Windtraders and a kiosk called Colors of Mo’ara. There is a seamless transition between the attractions, shops, and dining that the Valley of Mo’ara provides. Everything is so cohesive and co-existent with each other that it’s easy to fall into what feels like reality when truly it’s all Disney Imagineers expansive brilliance at work. Trekking through the Valley of Mo’ara is a stunning experience. Be in awe of the 22 floating mountains, cascading waterfalls, 250 varieties of living plants that are integrated with Pandoran plants, and a surreal soundtrack. You can expect the walking paths through the Valley to be full of people with its recent opening and incredible popularity. We do however feel that despite the crowds, the breathtaking details Disney put into this land are among the greatest we’ve seen on Disney property. Animal Kingdom is lovely enough – but this fantasy land seems so real… as if tele-transportation to another planet does exist! Outside of the mountains and waterfalls, we were also enthralled with the immaculate details that key in on the Na’vi culture from totems to native symbols. 5 – Why Visit at Night? Two words – bioluminescent lighting! The Valley of Mo’ara is extremely different in the daytime versus the nighttime. The walkways actually glow at night! While the walkways are slightly darker than we were anticipating, we still highly recommend the experience as it is now one of our favorite nighttime experiences on Disney property. Just imagine plugging in thousands of little nightlights that glow with beauty from high areas to low around you within the plants and unique lights. It’s such a unique and warm experience. With the perfectly cool Florida weather, the glow of the lights, and a Pongu Pongu drink in your hand – it’s hard to not make plans to join the Na’vi tribe forever! Nope, not the Flora and Fauna fairies you may know from the Disney classic, Sleeping Beauty. Merryweather would surely be angry she wasn’t included if that was the case! Flora and Fauna in this Disney realm are plants and animals. The Valley of Mo’ara pops with lush colors that are represented primarily through the Pandoran flora (plants). The unique and indescribable plants you may spot in the movie are right in front of you with all their beauty! These aren’t just any plants – as each plant has a purpose for the Na’vi people. You may spot what the Na’vi people call a “Vein Pod”. 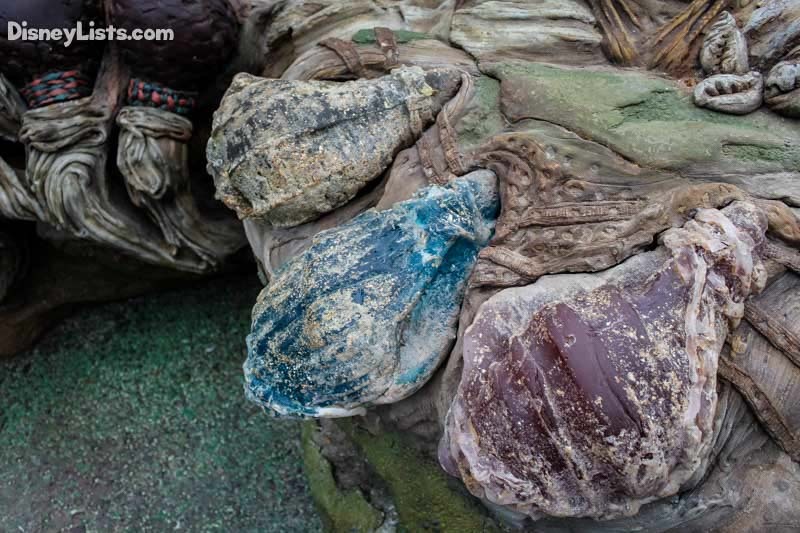 These Vein Pods help detoxify the atmosphere on Pandora, maintain stability in the environment. The “Grinch Tree” glows with beautiful bioluminescent leaves. We also spotted the “Dapophet” which Na’vi use for portable hydration. Feel the presence of the Pandoran fauna (animals) with the calls and sounds of the Viperwolf, Direhorse, and of course – the Banshee. Whether you are looking closely or focused on your feet, you can’t miss the interactions the Valley of Mo’ara gives off to Pandora guests. Check out Swotu Wayä (means “Sacred Place of Song”) in the Valley of Mo’ara to interact with a collection of Na’vi drums that are connected into the moon’s root system and respond with music and light! We were especially impressed when three Cast Members came out and put on a show with these drums. Be on the lookout for the Flask Reclinata, a Pandoran plant at the main entrance of the Valley of Mo’ara where guests can rub a portion of it and watch it mist – or in Pandoran terms… pollinate by releasing spores into the environment. A free experience and a great way to learn more about the Valley of Mo’ara is through the fun scavenger hunt known as Wilderness Explorers at Animal Kingdom. Learn about nature while exploring Animal Kingdom! 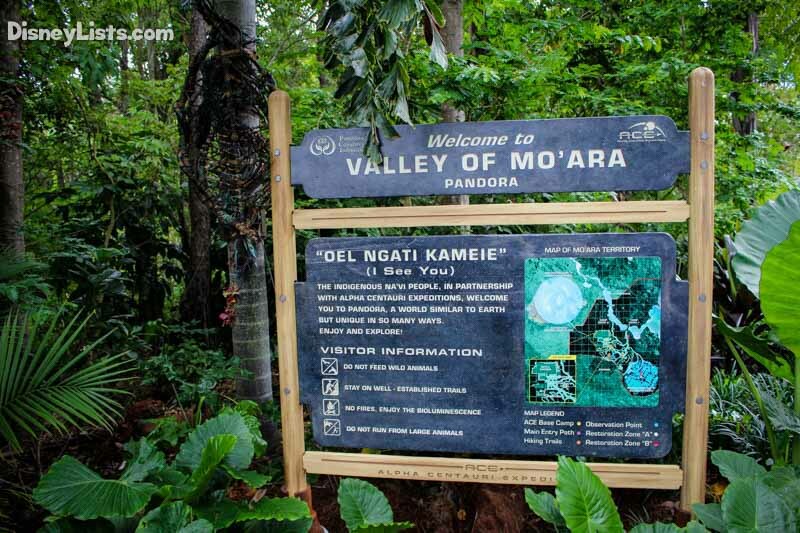 This program now offers to new badges located in Pandora – The World of Avatar where they share more about the flora and fauna in the Valley of Mo’ara and compare observations of the natural world of Pandora to nature on Earth. Wilderness Explorers are quick to even point out specific notches you can press on certain trees in the Valley that causes nature to interact through sounds with your touch! We all know that Cast Members rock, but Disney pulled in the best of the best to make Pandora – The World of Avatar a notch above the rest. These Cast Members are extraordinary from their patience dealing with the large and sometimes frustrated crowds, to remaining positive and engaged in sharing the Pandoran culture with guests. Greet at Cast Member with a simple Na’vi language “Kaltxi” (which means “Hello”) and you’ll be greeted in return. But the greatest way to make these Cast Members day is with “Irayo” (which means “Thanks”). Hand-crafted art, t-shirts, robotic banshees, and even Avatar action figures of yourself… the souvenirs here will make you want to break the bank! We especially loved the limited edition MagicBand designs exclusively for Pandora – The World of Avatar. One design is purple and features scenes from nighttime in Pandora which is the perfect way to remember the Valley of Mo’ara by. Our favorite souvenir, however, is a PhotoPass photo. Simply visit one of the PhotoPass locations in the Valley of Mo’ara and chances are they will bring your family photo to life in a Pandoran way!